In 2008, Dr. John Cannell, MD, Founder of Vitamin D Council, published the first paper suggesting a relationship between low vitamin D status and an increased risk of autism. He created his hypothesis based on the data that illustrated an increased prevalence of autism in the regions of greater cloud cover and rainfall. Only observational studies had confirmed his hypothesis until now. In a groundbreaking study, researchers proved that vitamin D supplementation reduces the symptoms of autism among children. Vitamin D plays an essential role in neurodevelopment and gene regulation. More than 2,700 genes contain vitamin D receptors, and vitamin D regulates the expression of over 200 genes. Furthermore, vitamin D deficiency during pregnancy is associated with adverse effects for the baby, including an increased risk of autism. 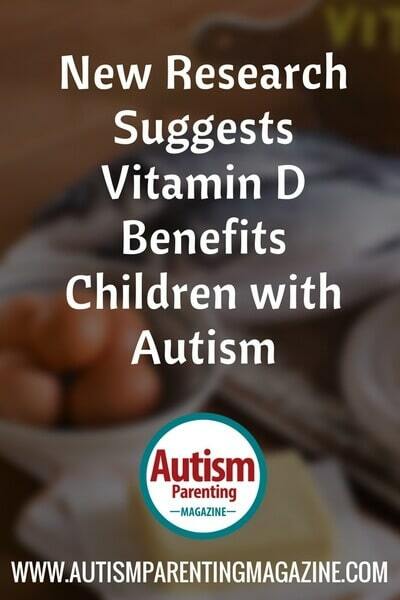 This evidence led researchers to recently conduct a randomized controlled trial (RCT), the gold standard of research, to evaluate the effects of vitamin D supplementation on autism in children. The RCT consisted of 109 children with autism spectrum disorder (ASD), ages three to ten years. Half of the children were randomized to receive a daily vitamin D dose of 300 IU per kg of body weight, equivalent to 136 IU per pound, but no greater than 5,000 IU daily. The other half received a daily placebo pill. The experiment lasted for a total of four months. The researchers assessed vitamin D levels, autism severity, and social maturity of the children at the beginning and end of the study. After four months, vitamin D supplementation significantly improved the core manifestations of ASD, which include irritability, hyperactivity, social withdrawal, stereotypic behavior, and inappropriate speech. The placebo group did not experience any significant improvements. Furthermore, children who received vitamin D supplementation experienced increased cognitive awareness, social awareness, and social cognition compared to those who only received the placebo. Vitamin D supplementation significantly decreased repetitive hand movements, random noises, jumping, and restricted interests. The study also mentioned that the supplementation regimen was well tolerated among the children. Only five children experienced minor side effects during the four-month study period, such as skin rashes, itching, and diarrhea. The study presents promising findings; however, the researchers reminded the readers that the study consisted of a relatively small number of patients, and further studies are needed to confirm the efficacy of vitamin D in ASD. Saad, K. et al. Randomized controlled trial of vitamin D supplementation in children with autism spectrum disorder. Journal of Child Psychology and Psychiatry, 2016. Amber Tovey is the Program Manager at the Vitamin D Council, a 501©3 non-profit focused on disseminating evidence-based information regarding the impact of vitamin D and safe-sun exposure for human health. She graduated from California Polytechnic State University, San Luis Obispo with a Bachelor’s of Science in Nutrition. Amber’s passion for public health and science led her to the Vitamin D Council in hopes of impacting the quality and longevity of lives worldwide. Outside of work, she enjoys spending time outdoors in the beautiful Central Coast of California where sunny beaches and gorgeous hiking trails are just minutes away from the office.